Now that our humble abode is about to be finished, I can say that I am starting to breathe a little better. I am not taking that sigh of relief yet as we still have to do the closing but I am positive that it's going to happen really soon. 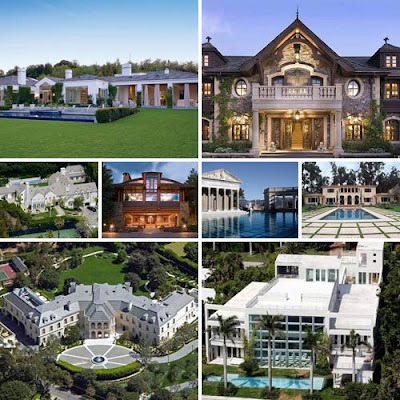 "25 Ludicrously Expensive Celebrity Homes"
After seeing these houses, I can't help but think that our little home will probably fit in one of the rooms in one of these houses...LOL. But I'm fine with that. If and when we win the lotto big time, I will make sure to buy one of these houses...Not! susme, gusto ko kayang tumira dyan? hhhayyy, some guys have all the luck, malay mo nga, one day we hit the lottery, would you give up blogging?? LOL. bakit mo dinis-play house ko? still waiting for the owl. kaya the weekend plan depends on the owl's arrival. The bottom left is ours Jul hehehe. I love those big houses but am scared to live there, I always feel like a haunted house when its that big! "cools talaga ng Filipino showbiz! hahaha! anyway, kilala nyo itong male director na mahilig sa…in this blind item? very intruiging eh… http://www.stir.ph/LM/articles~level2/id1238730070736_5/ainull/Two_rounds_of_sex_for_the_price_of_one.html"